Made of durable paper, these cups will hold liquids without spilling or leaking, so they'll keep your customers' hands dry as they enjoy a refreshing beverage or treat. 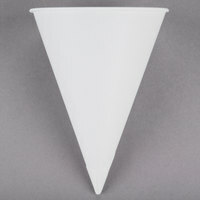 Our paper cone cups come with a rolled rim construction for easier and more comfortable sipping, and some cups are compostable for environmentally-conscious businesses. 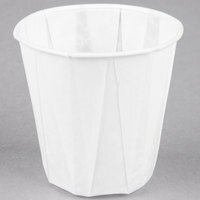 Since we offer pleated paper cups in bulk quantities, you can also be confident you'll have enough supplies to serve large crowds of customers without running out. 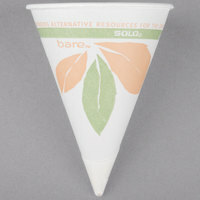 Also make sure to check out other great items from Dart Solo and Genpak. 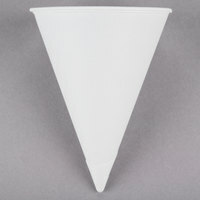 Our cone cups come in a variety of sizes that can hold a small amount of water or an extra large snow cone, depending on your serving needs. 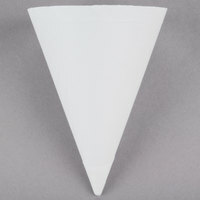 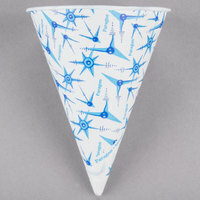 Some of our paper cone cups even come with printed designs that are perfect for serving cold desserts! When your employees or customers are done using these cups, they can simply throw them away for cleaning convenience. 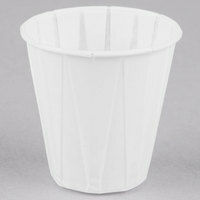 For ways of storing your cups, be sure to check out our wall mount cup dispensers, in-counter cup dispensers, and countertop cup dispenser cabinets. 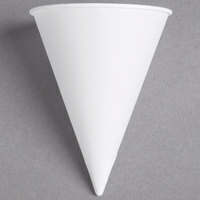 If you're wondering where to buy paper cone cups and pleated paper drinking cups, we have a large selection of paper cone cups and pleated paper drinking cups for sale at the lowest prices.